In this superfast, digital, tech era we often hear people questioning the need for libraries - 'I can just google it’ or ‘I can get it online’ are common phrases batted around. This is of course overlooking the far wider benefits that libraries bring to local communities, the positive impact on health and economic wellbeing, or even the economy itself. Indeed libraries act as ‘the great equaliser’ - safe, trusted and impartial spaces, where anyone from any walk of life can access services. The success of the British Library’s own Business & IP Centre service is evidence that libraries have an important role to play in helping businesses to innovate and grow. If all that doesn’t produce a flutter of excitement in their steely hearts, then perhaps something that will appeal is the idea of the library as a maker space, a rapid prototyping hub, a place for creative collaboration and sharing of ideas. Sure you can join online forums to share ideas, but you probably don’t have a CTR TMX12 Laser Machine in your garden shed! Exeter Library’s FabLab is one such space; ‘an open access, not-for-profit, community resource where anybody can invent and make just about anything.’ It is the first ever to open in a UK public library and boasts a plethora of machines such as a Pro-Router, Vinyl Cutter, the aforementioned Laser Machine and of course the obligatory 3D printers. 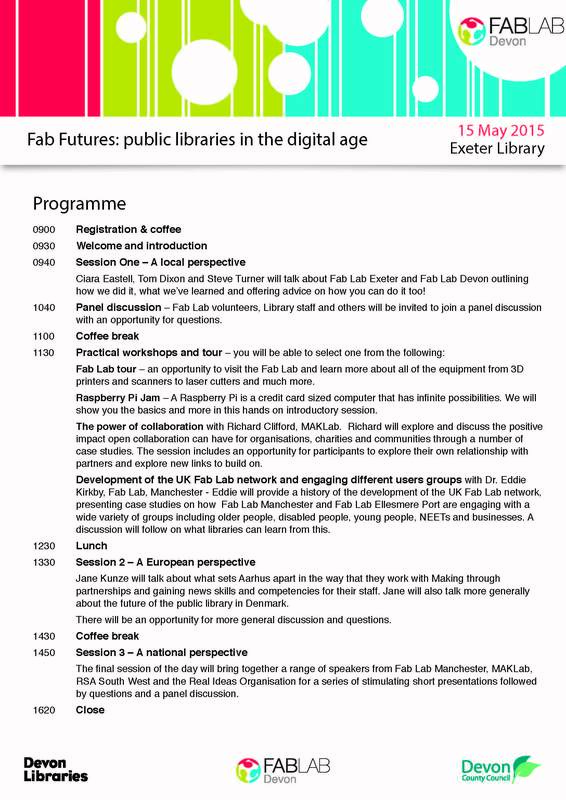 So successful have they been, that the library hosted a Fab Futures conference last Friday 15 May, bringing together experts from across the UK and the globe to talk about how libraries can support innovation and creativity in the 21st century, and how they’ve done it in Exeter. The day offered a local perspective with the lab volunteers and library staff talking through the prototyping equipment, offering hands on introductory taster workshops and showcasing the versatility of the machines. Speakers attending from Mak Lab Glasgow, Fab Lab Manchester and Fab Lab Ellesmore Port, talked about the social significance and impact of the UK Fab Lab Network through engaging local communities, older people and disability groups as well as charities and businesses with the possibilities of digital manufacturing. A Google Link up with Chattanooga Library in Tennessee showcased their innovative 4th floor ‘public laboratory’, highlighting an intuitive partnership with Etsy, where their digital equipment is used to manufacture products which are then sold on the Etsy platform. Take a look at the full programme for the day and the storify of the event. Fab Lab Exeter is a great facility for local entrepreneurs and creatives to access low cost or free digital making in a shared learning environment, and the perfect space to develop prototypes for new products and designs. To complement the Fab Lab, in the next twelve months Exeter Library will be joining the British Library’s National Network of Business & IP Centres in city libraries across the country. The Business & IP Centre will connect the Fab Lab’s innovation activities to intellectual property support and business information resources, helping to create healthy and sustainable businesses across the region. The current Business & IP Centre National Network provides support for entrepreneurs and inventors in Newcastle, Leeds, Sheffield, Liverpool, Birmingham and Manchester which also had a Digital Demonstrator Suite. Here in the UK the libraries’ ‘maker movement’ has been a bit slow off the mark compared to our cousins across the pond, but it’s starting to gather momentum. Led by the likes of Exeter’s FabLab, or indeed Common Libraries National Science Experiment, we might in the near future find that people are as likely to pop to their local library for a ‘raspberry pi jam’ as they are to borrow a book. Does your local library run any ‘maker sessions,’ ‘raspberry pi jams’ or ‘library hacks’? If so, get in touch, we’d love to hear more and visit one of our National Network of Business & IP Centres soon.